- First place: 1500 €. As a result of increased demand on hospitals, healthcare professionals are seeking to optimise their efficiency, ensuring each individual patient is treated swiftly, without compromising the quality of care. In order to achieve this, healthcare professionals are counting on Thales' proven track-record and 60-years of experience in the radiology field, to spearhead the advancement of innovative imaging solutions. Digital detectors and their imaging software are the eyes of radiology systems. Thales specialises in fixed and portable detectors, as well as the accompanying image processing software which ensures unprecedented image quality for medical teams. Nowadays, over 50% of radiology examinations worldwide are being performed using solutions designed by Thales. As new technologies are being introduced to the radiology domain, healthcare professionals must adapt to a market that is frequently changing and developing. In response, Thales is focusing on this digital transformation, supporting end-users as surgeons by concentrating developments around four main pillars: Cybersecurity, Internet of Things (IOT), Artificial Intelligence (AI)/machine learning and Big Data. Thales AVS France, with its teams specialized in the development of radiology softwares, is at the forefront of the digitalisation of radiology, bringing together its core technological expertise with its internal synergies (Digital Factory, CortAlx, etc.). As a white box partner, we accompany our customers on their real-time information systems. Our services are as much for large groups as technological start-ups. Combination of both allows us to work on complex projects with strong technical, economic and human challenges and to support the most innovative projects. With a vertical business approach, we work on all layers from the sensor to the cloud through a system engineering vision. More simply, we are a company that celebrates its 5 years of existence. We have our name from the Kaizen method, a process of continuous improvement that involves all actors in our society. For our teams, this means a customized support throughout their careers and ever more innovative projects! The Grenoble Alpes Data Institute undertakes interdisciplinary research focusing on how data change science and society. It combines three data related fields of research in a unique way: data science applied to spatial, environmental, and health sciences; data-driven research as a major tool in Social Sciences and Humanities; and studies about data governance, security and the protection of data and privacy. The purpose of this challenge is to carry out spot detection in X-ray medical images in the surgical field. 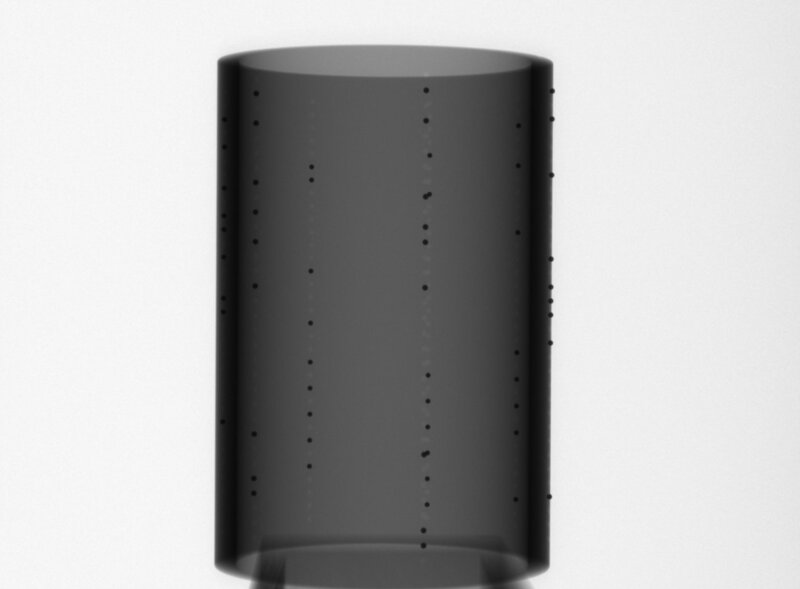 The scanned object is a calibration chart composed of 61 radiopaque steel balls. The nature and geometry of this object are perfectly known and the aim is to accurately determine the center position of the steel balls in the images. This information is then used to calibrate the acquisition device. In the future, the final goal of this operation is to bring patient 3D image reconstruction inside the medical operation rooms, based on acquisition machines such as the mobile C-Arm (2D radiology images) that are less expensive and more practical than other larger machines. Please find below an example of X-ray image of the calibration chart. Steel balls appear as black spots. The goal of this challenge is to detect these spots and accurately localize their center. Images provided in this challenge are small window images extracted from actual acquired data. Each dataset is composed of a .tiff images stack and a .csv file (description of the images stack). An images stack is a succession of 24 x 24 pixels gray scale images extracted from the actual x-ray projection using a sliding window. Several x-ray doses have been used to acquire the images resulting in images with various noise levels. Furthermore, we focus on the detection of entire balls in the image. Thus, the center of the detected spots should be between 4 and 20 pixels, otherwise the spot will be ignored. In addition, there is 0, 1 or 2 spots on the images. Datasets are approximately composed of 48% of images without any spots, 48% of images with one spot and the last 4% are images containing 2 spots. Finally, a basic problem is proposed for this first challenge edition: a simple object is scanned resulting in a homogeneous background. In the future, a new challenge edition might involve more complex images, including real medical background such as anatomical pieces or surgical tools. The following “Terms and Conditions” (hereinafter referred to as the “T&Cs”) shall apply to the THALES AI Challenge (hereinafter referred to as the “Challenge”) organized by THALES AVS FRANCE SAS (hereinafter referred to as “THALES”) and shall prevail over any provisions notwithstanding anything contained to the contrary. The problem to be resolved by the participants of the Challenge is : “accurate bullets detection in X-ray images”. The registration for the Challenge shall begin on March 21th, 2019 and the Challenge shall continue till May 21th, 2019 (hereinafter referred to as “the Challenge Period”). THALES reserves the right to withdraw or extend the Challenge Period, at any stage, without any liability whatsoever. (e) can only participate in his/her own individual capacity and not represent any government/public/private entity even if the Participant is working in a company or pursuing education. By submitted a result to THALES for the purpose to answer to the problem as defined in Clause 1 above (hereinafter referred to as the “Result”), the Participant shall be deemed to have accepted the T&Cs. If a Participant chooses to submit a Result, but is not eligible, THALES reserves the right to evaluate it for scientific purposes but under no circumstances will such Result be qualified for award as defined below. Judgement criteria of the Results submitted by the Participants are available on the challenge web page, under the “Evaluation and Metrics” tab. - First place: 1500 euros, 1st winner certificate. - Second place: 1000 euros, 2nd winner certificate. - Third place: 500 euros, 3th winner certificate. The amount indicated above will constitute the total amount that will be paid by THALES to the Winners with respect to the Challenge. THALESwill not collect any personal or private information other than the information produced by the Participants. THALES is entitled to assign, contribute or transfer, either directly or indirectly, all or part of its rights and obligations in connection with this T&Cs, without the Participants' prior written consent. THALES may at any time and without notice change the T&Cs. Ownership of all intellectual property rights of any Result shall be retained by the Participant who has produced it. The Participants shall grant to THALES, in exchange of the participation and the potential award, an irrevocable, free of charge, non-exclusive, world-wide right and license to use and exploit directly or indirectly the Results submitted or produced by the Participant and other material that may be submitted by the Participant in connection with the Challenge (including the right to make, have made, to sell, to modify, have modified, to reproduce, to market, to distribute, to load, to store, to display), without limit of time, as far as necessary for the good performance of future researches by THALES in connection with the Challenge and more generally for any use or exploitation of such Results. Such license includes the right for THALES to grant the same rights, totally or partly, to any third parties for the same purpose as above mentioned. The Participants agree to sign any documentation that may be required by THALES to make use of the rights granted above. The information and data (hereinafter referred to as "the Information") contained in any document or information medium provided by THALES during the course of the Challenge or in relation with the Challenge remain, subject to the rights of third parties, the sole property of THALES as do all intellectual property rights thereto. The Participants shall not use the Information for purposes other than performing the Challenge. The Participants shall keep the Information strictly confidential and may not disclose it in whole or in part to anybody. The Participant shall hold THALES fully harmless from and against any claims, actions, suits, or proceedings, as well as any and all losses, liabilities, damages, costs and expenses (including attorneys’ fees) brought against THALES, in any place whatsoever, by a third party or third parties related to the infringement of any patent, copyright, trademark or any other intellectual property rights generated by the Results. THALES may under no circumstances be held liable to the Participants for any losses such as loss of profits, loss of orders, loss of use, loss of interest, and more generally any direct and/or indirect and/or pure financial loss suffered by the Participant because of its participation to the Challenge. The present T&Cs are subject to French law. In the event of a dispute arising between THALES and the Participants, the dispute shall be brought before the Paris courts having jurisdiction. When participating to the Challenge, you will share your personal data with THALES, by producing information mandatory regarding your age and nationality, acting as data controller. This data is used to communicate with the Participants, sort their submissions and attribute award. Please note that, in order to carry out the processing activities specified therein, THALES relies on your consent, which you can withdraw at any time, without affecting the lawfulness of processing based thereon before its withdrawal. The provision of your personal data is a requirement necessary to enter into a contract and mandatory. Should you decide not to provide your personal data, then THALES is then going to be unable to contact you in case you win the Challenge. For the abovementioned purposes, your personal data will be kept 4 months. THALES may rely on other entities of the group, partners or service providers for providing you with the best services. In case of any such request or complaint, please send an email to fanny.morin@thalesgroup.com. The evaluation criterion is based on the metric proposed for the ImageNet challenge. Its objective is to quantify both the veracity of the number of spots detected per image and the accuracy of center's localization. The global metric in a weighted average of the score of each image class (0, 1 or 2 spots). Then, a score based on the distance (computed in pixels) between the true and the detected centers is computed to evaluate the localization accuracy. 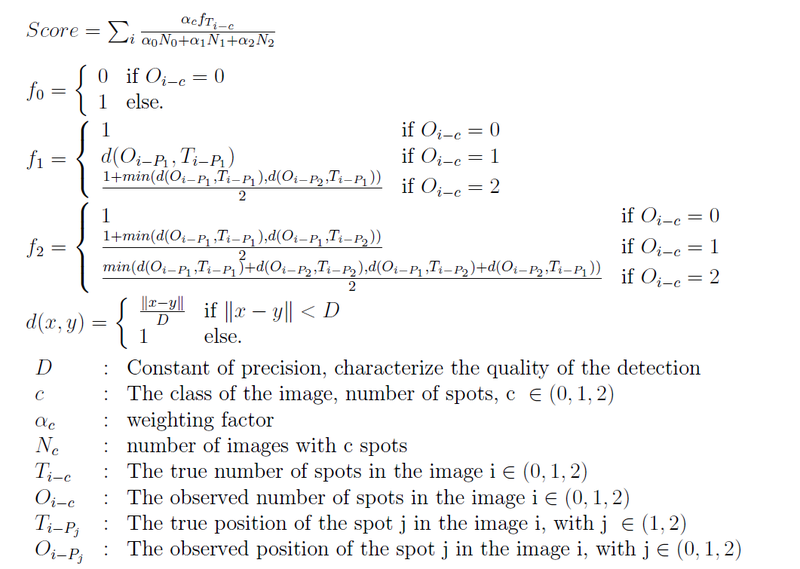 The function d ensures a minimal accuracy for the localization: if the detected spot is localized further than 2 pixels from the real spot then the spot is considered as if it was not detected. The aim of the competition is to minimize this evaluation metric. The αs are chosen so that images without balls account for 20 % of the final score, images with only one ball account for 50% of it and images containing two balls account for the last 30%. A submission consists in a .zip archive containing a file with your predictions on the complete validation dataset. This predictions file must be named answers.csv. You will be assessed on the entire validation dataset. However, the score given on the leaderboard is not computed on the full dataset. In addition, proposed solutions must be based on machine learning algorithms and winners will be asked to provide their codes with a short explanation. An example submission has been done using our account. The solution doesn't use machine learning but is based on a classic blob detection algorithm relying on the OpenCV library. This is the baseline you have to overcome. Description: During this phase, you have to develop and train your machine learning algorithm to predict spots localization in the images. This will be the only phase of the competition. May 21, 2019, 11:59 p.m.